Well…OK. It’s not like I ever met her. And no, she doesn’t know me from Adam. But the house where I grew up is about a mile from the one where she did. And if it not for a district boundary between us, we would have been in the same high school at the same time. We almost certainly passed each other on the street somewhere. She would have camped with her group of friends at the Pickwick Theatre on a Friday night at the same time I did with mine. On my summer job at Richard’s Men’s Wear, maybe I once sold a sport coat to her Dad. 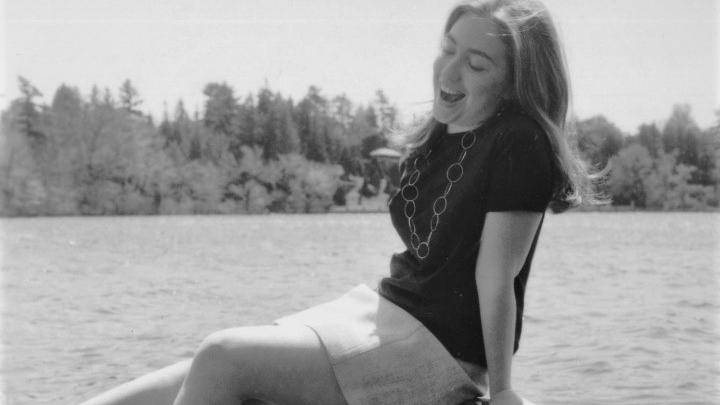 My point here is that I know where Hillary comes from—figuratively as well as literally. And the reasons you might not love her –the seeds of ‘Hillary hate’--probably come from being raised in that place at that time. Let me deal first with place. Our neighborhood was solidly conservative, in the traditional sense of the word. Sheltered. Cautious. Standing for the ‘right things’. My Mother was always proud that our ward elected the only Republican alderman in Boss Daley’s solidly-Democratic Chicago. In terms of time, I think the best way to describe that period is the 60’s before they became “The 60’s”. As a minister who knew Hillary then told the Washington Post, kids knew the rules: “Be nice. Don’t drink, don’t smoke, don’t say dirty words, don’t pierce your ears and don’t be contaminated by the world outside.” There was an accepted sense of order inside our bubble. Now, to be clear, not everybody was the same. The guy who wrote the hit musical Grease went to my high school. And watching John Travolta and Olivia Newton-John in the movie version, you won’t find former Cub Scouts or future stamp collectors. In fact, the definitive social divide in our schools at that time was between those ‘greasers’—with their black socks and leather jackets--and the ‘collegiates’, with white socks and letter sweaters. That was it. We didn’t have stoners. We didn’t have goths. And while there were certainly plenty of geeks, they hadn’t figured out yet how to get together and take over the world. · Play by the rules—but stand up and speak out. We were taught to uniformly obey authority—parents, teachers, the cop on the beat. We were free to run our race, but we knew where the guardrails were. However, within those guardrails, acceleration and passing were not just allowed, but quietly encouraged by authority. After all, there must be winners. From those winners, exceptionalism was expected. The problem was, as a ‘girl’, you started the race 20 yards behind. Still, Hillary’s high school resume overflows with standing up, standing out…and passing almost everyone else in the process. · Break out of the bubble. In high school, you’re obsessed with high school. Who’s dating whom? Who should be homecoming queen? Can you believe he said that in class!? But some learn to look wider. The same minister quoted above took it upon himself to expose kids to what lay beyond. That meant talking about the poetry of E.E. Cummings…debating the content and meaning of Picasso’s Guernica…and taking kids--including Hillary--to hear a talk by Dr. Martin Luther King, Jr. This is how she first broke out of her bubble, adopting a viewpoint that would come to include—quite literally—the whole world. · Say it straight. We might have known not to speak until spoken to; but once we did, there was no pretension. Nobody back then liked or tolerated a braggart. And false modesty wasn’t in the cultural playbook yet. Sugar-coating and evasion weren’t Hillary then, and never have been. She certainly could have saved a lot of grief and ridicule had she never identified (100% correctly) the “vast right-wing conspiracy” working against her and her husband. Or had she not defended her professional aspirations by stating, “I guess I could have stayed home and baked cookies…”. Or by calling out “the deplorables.” Or, speaking of the current morass, “…there’s no doubt in my mind that Putin wanted me to lose and wanted Trump to win. And there’s no doubt in my mind that the Trump campaign and other associates have worked really hard to hide their connections with the Russians.” Some people simply can’t handle the truth. She could. Those who parrot the line that Hillary is a perpetual ‘liar’ have it 180 degrees wrong. Her problem is not evading the truth. It’s openly speaking it. Let me coalesce this into one moment in time. It’s February of 1964. The Beatles arrive on Ed Sullivan’s stage. The Warren Commission hearings begin to attempt to determine who, exactly, assassinated JFK. The man who would be called Muhammad Ali wins his first heavyweight championship. And in South Vietnam, a new leader quietly approves the first covert operations in his country by U.S. forces. And in the halls of Maine West high school, Hillary Clinton is running for student council president. In the wake of that defeat, she demonstrated maybe the single most fundamental requirement for growing up in our place and time--take a punch. Kids whose parents fought through World War II weren’t coddled or ‘helicoptered’. We were given opportunities, expected to seize them—and most of all, to get the hell up once you’d been knocked down. Hillary was described as friendly and popular by most. But her high school newspaper also imagined her ultimate career as, “Sister Frigidaire”. Was she ‘cold’? Well, back then, those who truly aspired didn’t sulk at a setback, look for someone to blame, or ask for help--even when hurting. They remained apart. Seemingly above. And given that fundamental reserve, she would not have been the only person in those days to be called ‘stuck up’, a ‘brown-noser’, or ‘too big for her britches’. A Frigidaire. A few months later, taking the role of Barry Goldwater in a mock debate against a student posing as Lyndon Johnson, she won handily. Years after, her opponent said that what she lacked in the charisma needed to win the student council presidency didn’t matter in their debate, where victory depended on preparation and intellect. That was her gift. This is who she was. And who she is. Convinced she can make the world a better place: by singlehandedly pushing for a new national health care system, long before the idea became fashionable; by serving as a U.S. Senator; and by becoming Secretary of State. And then, campaigning as the most qualified person to run for the presidency since Jefferson. There are a dozen good reasons for that defeat, from campaign missteps to Comey to the Russians. And to be certain, as a key Democratic strategist said, she is not gifted as a ‘retail politician’—not compared to the man she wanted to succeed, Barack Obama, or to the man she married. But to me, a special circle in Trump hell is reserved for those so bitter after Bernie’s dismissal that they withheld their vote altogether—or even cast it for someone else. Shame. But we’ve seen this play before. In 2000, stung by the Lewinsky mess, Al Gore chose to keep President Bill Clinton on the sidelines during his own presidential campaign. In a race where he narrowly lost (or actually, may have narrowly won), the charisma of Bubba could have been decisive. But Gore, too, decided the Clintons should just go away. And now, Democrats need to decide how, if at all, to relate to Hillary. She will always come across as prickly. As too outspoken and too reserved at the same time. But it would be a mistake to equate this with a lack of popularity. In history, only Barack Obama in 2008 generated more votes in a presidential election. (And her total in 2016 was greater than his was in 2012). Some of her votes may have been cast half-heartedly. Many certainly were anti-Trump protests. But millions came from passionate supporters. What they saw was the outspoken high school kid…the one who dared to ‘punch above her weight’…and consequently has been willing to take one roundhouse after another. The lesson for Democrats seems clear to me: you don’t have to love her…but it would be a grave mistake to leave her. Preparation and intellect still matter.